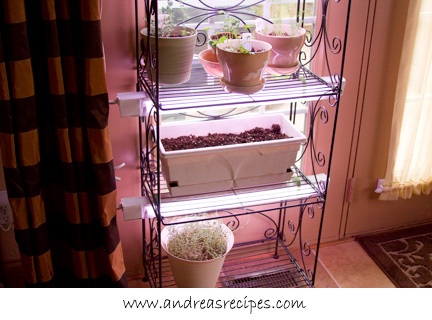 We keep an indoor garden year round, growing mostly herbs but also some greens. 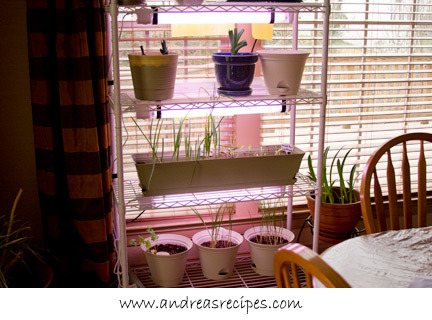 We don’t have an elaborate setup, just a couple shelves positioned at western and southern-facing windows with inexpensive grow lights attached. We run the lights from sunset to sunrise to help give the plants plenty of growing time and warmth. This year we are growing basil, cilantro, mint, thyme, dill, parsley, romaine lettuce, butterhead lettuce (just seeded after spinach crop failure), scallions, and leeks. We also have a bay laurel in a pot, and although it’s twice as large as it was in the spring, it won’t be ready for another few years. I’ve not had success growing tomatoes indoors, but I’m going to keep trying until I get it figured out, and I’m still tempted to try growing a Meyer lemon tree indoors. In the spring I plan to put some ginger in a pot, too. 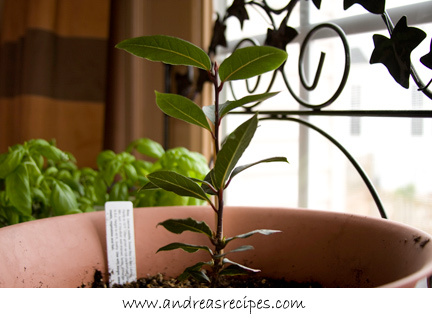 Lately I’ve been experimenting with growing herbs and vegetables by sprouting. Sometimes it works well, for examples with scallions, mint, and leeks. For these leeks I saved the bottom inch of white along with the roots and just stuck them in pots to see what would happen. 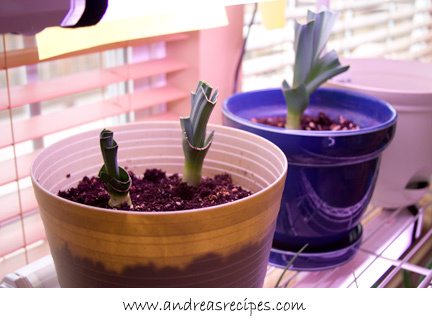 The leek in the blue pot went into dirt about 10 days ago and the two smaller ones went in one week ago. Just like the green onions, they started to sprout within a few days. It’s so easy, just make sure the roots are still white and not dried out, form a hole a couple inches deep, and stick the piece of leek down in deep. Cover with dirt, add a little water, and keep in a sunny spot. 1. My bachelors degree is in music education (vocal/choral), and I still love to sing torch songs, vocal jazz, and acapella choral music. 2. I grew up loving horses and enjoyed riding until I had an accident while on vacation in Australia. Permanent back problems since. 3. I held a part-time job at Arby’s during my freshman year in high school, and I still like the jamocha shakes. 5. I am the oldest sibling in my family, with one sister and two brothers. 6. My favorite tea is Earl Grey, with milk of course. 7. My first computer was a used Apple IIe, which died a sudden and disturbing death, and my next computer was a Mac Classic. The rules for these things state that I should tag some friends, but I’m horrible about these things. I hate to offend those who don’t get picked or offend those who don’t like memes. So if you read my 7 random things and would like to add some things about yourself in the comments, please share! What a coincidence, Andrea! My background is in vocal/choral music too. I’m a lyric soprano and in addition to my solo/recital work, I’ve sung with several professional choruses. I’ve also been an elementary school choir director and have been part of a vocal jazz quartet for 15 years. Who knew we had so much more in common besides food! Love seeing how you’re growing all those things indoors. that’s something I haven’t done too much of, but I’d love to try it. Wow! What a great set up. We don’t have a winter garden, but I’ve been thinking about the idea for quite a while. Thanks for playing along on the 7 things meme! Annie and I both like Earl Grey with tea as well. So you’re growing dill indoors? How do you keep it from getting too tall or going to seed? Kalyn, it’s pretty easy to grow indoors, just need a few things for the setup. Kim, thanks! You should try it! Nate, thanks. The dill grows best in cool weather and will stay in the leafy stage longer than in warmer weather. We keep our house temp at 64 F in the winter, and dill and cilantro both grow pretty well in that temp.